Do they pay their workers a fair wage? Is their travel climate-sensitive? What about fundraising from wealthy donors? WASHINGTON — From the way candidates treat their staff to their modes of transportation to how they fundraise, the campaign itself is increasingly a central part of the message for many of the Democrats running for president in 2020. In a crowded field and a cynical age, even White House hopefuls with detailed policy platforms are highlighting the way they manage their own campaign operations to stand out from the pack and offer proof of their values. Senator Bernie Sanders, I-Vt., announced Friday that his campaign staff would be unionized — possibly the first presidential candidate to do so — a move that dovetails with Sanders' populist, pro-labor message. The focus on campaigns also coincides with a rise of progressive activism in the party, one that treats the existing political system as fundamentally corrupt and broken. Facing a skeptical electorate, candidates are eager to use their campaigns to demonstrate that they won't operate like the detested status quo. Jumping off a midterm trend, most of the 2020 candidates have renounced donations from corporate PACs as evidence of their commitment to reducing the influence of big money in politics. And so far, all but Washington Gov. Jay Inslee are refusing to give their blessing to allied super PACs in the primaries, which were a regular feature in the previous cycle. But Sen. Elizabeth Warren, D-Mass., went a step further, announcing she would hold no face-to-face private fundraisers at all, instead relying entirely on grassroots donations. Less time talking to donors means more time talking to voters in a wider variety of places, she's said, a point she has emphasized by stumping in places like Mississippi and Alabama. Meanwhile, Julian Castro, the former housing secretary, has pledged to pay interns $15 an hour to do his part in bringing all kinds of people into politics, not just those who can afford to work for free. And Inslee, running primarily on a message of climate change, has refused donations tied to fossil fuel. Several trends could be driving the focus on campaign operations. Candidates are looking to prove their purity against President Donald Trump, whose alleged ethical lapses and business conflicts are a source of outrage to his critics. And they're as eager to prove their authenticity, a nebulous quality that Hillary Clinton was frequently accused of lacking in 2016. The rise of the #MeToo movement and a new emphasis on working conditions at companies like Amazon has also brightened the spotlight on how candidates function as bosses. The last year has also seen a movement to unionize campaign workers grow, which supporters argue is the only way for Democrats to practice what they preach. The campaign operation itself as the message also can be seen with Beto O'Rourke, whose appeal is rooted in his relentless schedule of retail campaign stops — which he drives himself to — unscripted livestreams and small donor fundraising. He'll figure the details out later. The point is that he's a down-to-earth Texan who listens to you, keeps it positive and will "show up everywhere for everyone." O'Rourke talks about the power of this style of campaigning constantly on the stump, more than he talks about any specific policy, seeing the campaign as an end unto itself as much as it is a means to winning the White House. "The next president has to win in a way that unifies the country, brings the country together in order to begin that work on Day One," he told one Iowa voter concerned about hyper-partisanship. "If we wait until someone’s president to address this, it may be too late." The new focus on campaigns has led to some negative stories as well: Sen. Amy Klobuchar, D-Minn., has dealt with complaints from former staff that she treated them poorly and suffered from high turnover as a result. Klobuchar has tried to turn it into a positive, saying on NBC News' "Meet the Press" on Sunday that the issue arose "because I want to have high expectations for myself and the people around me and for our country." Sanders also apologized this year after former supporters complained about sexual harassment on his 2016 campaign. "When we talk about ending sexism and all forms of discrimination those beliefs cannot just be words," he said. "They must be reality in our day to day lives and the work we do — and that was clearly not the case in the 2016 campaign." And it could expose candidates to charges of hypocrisy, fair or not. Inslee, for instance, has been pressed on why he flies to campaign stops instead of taking greener transportation options, like the train, even though that's not a realistic option. And activists working on social justice causes have made clear that they’ll be grading campaigns on how much their staff resembles their voters in terms of gender and racial diversity. In some ways, it’s a natural continuation of the 2016 race. Sanders' signature average donation of $27 — a number his crowds would shout on cue — was a key part of his message that only a candidate with grassroots support could take on well-heeled elites. Trump took a similar tack in his 2016 primary run by (mostly) refusing to accept campaign donations and refusing to accept outside support from super PACs, a stance he has long since abandoned. "I’m not doing anything about raising money, I don’t care about raising money," he said in 2015. "Part of my thing is, frankly, I’m not controlled by anyone, because other people are raising hundreds of millions of dollars." 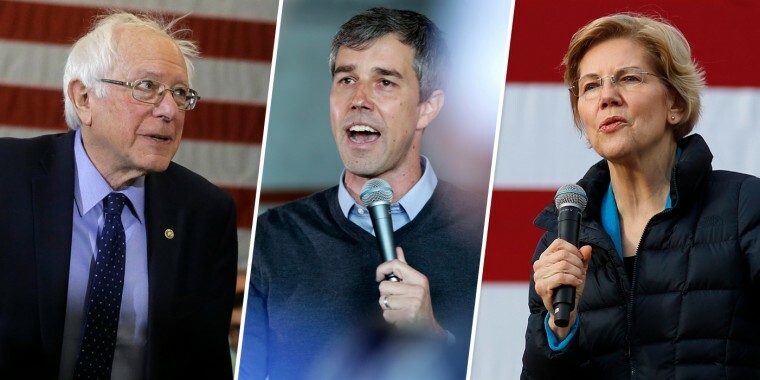 Politically, by laying down a marker on how they run their own campaigns, Democrats in 2020 can stand out in a crowded field and apply some pressure on their rivals without having to go on the attack. "For every time you see a presidential candidate talking with voters at a town hall, rally or local diner, those same candidates are spending three or four or five times as long with wealthy donors — on the phone, or in conference rooms at hedge fund offices, or at fancy receptions and intimate dinners — all behind closed doors," Warren wrote when she announced her prohibition on in-person fundraisers.